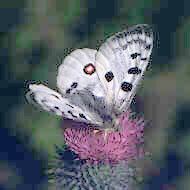 Apollo, Parnassius apollo, is a butterfly described by Linnaeus. More than half of all species on earth are insects. How did this group of animals become so successful? One important reason is that the insects have their skeleton on the outside instead of inside the body. The outer skeleton efficiently protects the soft inner parts. Other reasons are their adaptations to land life and their ability to fly. Many insects also have two different stages in life, something that is called a ”complete transformation”. A butterfly for instance, lives both as a crawling larva and as a flying butterfly. These different qualities have together made the insects able to adapt to many different niches in nature and produce many species. Linnaeus had an eye for small details and described many insect species. In Systema Naturae 1758 he described 50 species of butterflies and 125 species of flies in Sweden. Today we know 113 butterfly and 4070 fly species from Sweden. Already in Linnaeus’ time most of the butterfly species of today were known but not nearly all flies. An explanation is that the attractive and beautiful organisms are often the first ones to be investigated. The plainer organisms often have to wait longer to be investigated. How are new species discovered today? It is often the case that what was considered one species in the 18th century is today found to be several, rather similar species. Examples of this are the cluster flies.